"Mom always added 1 lb. cooked ground beef to her Spanish Rice." 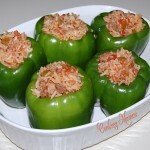 Spanish Rice: In a large skillet over medium heat, sauté onion in vegetable oil, cook until tender, about 5 minutes. Add rice into skillet, stirring often. When rice begins to brown, stir in chicken broth and salsa. Reduce heat, cover and simmer 20 minutes or until liquid has been absorbed. Preheat oven to 350 degrees. Prepare peppers by slicing off the stem end of the peppers, saving the tops. Using a spoon, carefully remove the core and seeds. 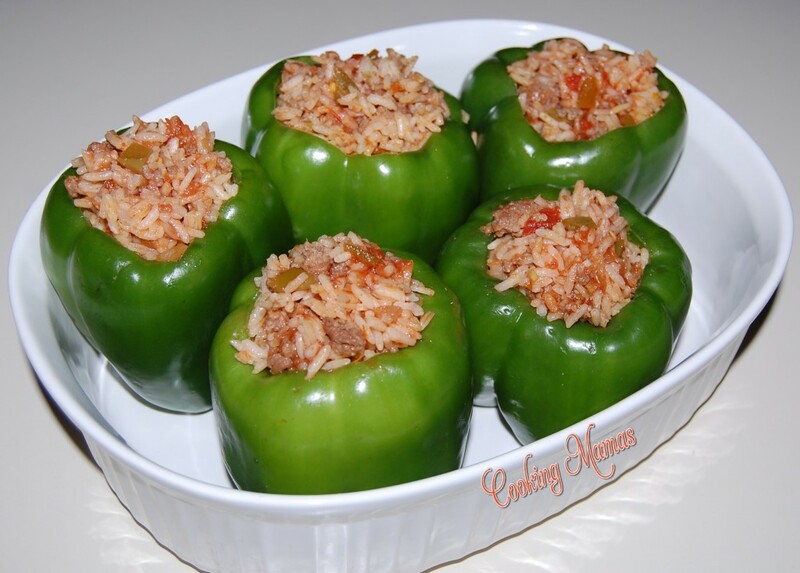 Fill the peppers with Spanish rice, gently pressing down with the back of a spoon. Put the tops on the peppers and arrange them standing up in a 9x9 inch baking dish. Pour 1 cup of water into the baking dish to create steam. Cover with foil and bake for 45 minutes. Uncover and cook another 15 minutes. Cook's Note: You can add 1 lb. lean ground beef to oil and onion, cook until no longer pink, if desired.